Civil forfeiture in the United States, also called civil asset forfeiture or civil judicial forfeiture or occasionally civil seizure, is a criminal justice financial obligation. It is a legal process in which law enforcement officers take assets from persons suspected of involvement with crime or illegal activity without necessarily charging the owners with wrongdoing. 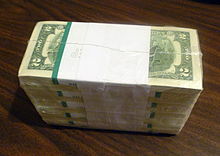 While civil procedure, as opposed to criminal procedure, generally involves a dispute between two private citizens, civil forfeiture involves a dispute between law enforcement and property such as a pile of cash or a house or a boat, such that the thing is suspected of being involved in a crime. To get back the seized property, owners must prove it was not involved in criminal activity. Sometimes it can mean a threat to seize property as well as the act of seizure itself. Proponents see civil forfeiture as a powerful tool to thwart criminal organizations involved in the illegal drug trade, with $12 billion annual profits, since it allows authorities to seize cash and other assets, from narcotics trafficking. They also argue that it is an efficient method since it allows law enforcement agencies to use these seized proceeds to further battle illegal activity, that is, directly converting value obtained from illegal items for law enforcement purposes by harming criminals economically while helping law enforcement financially. Critics argue that innocent owners can become entangled in the process to the extent that their right to property is violated, with few legal protections and due process rules to protect them in situations where they are presumed guilty instead of being presumed innocent. Further, critics argue that the incentives lead to corruption and law enforcement misbehavior. There is consensus that abuses have happened but disagreement about their extent as well as whether the overall benefits to society are worth the cost of the instances of abuse. Civil forfeitures are subject to the "excessive fines" clause of the U.S. Constitution's 8th amendment, both at a federal level and, as determined by the 2019 Supreme Court case, Timbs v. Indiana, at the state and local level. Civil forfeiture laws have been traced back to the British Navigation Acts, which allowed seizure of ships and goods on suspicion of wrongdoing. The idea of going at people through their property has a long history. The theories are quite old. The prevalence of the practice is comparatively recent. ... (A) vessel which commits the aggression is treated as the offender, as the guilty instrument or thing to which the forfeiture attaches, without any reference whatsoever to the character or conduct of the owner. (The seizure of the ship is justified by ...) the necessity of the case, as the only adequate means of suppressing the offense or wrong, or insuring an indemnity to the injured party. During the later Colonial years, forfeiture practices by the Crown officials using writs of assistance were one of the many activities that angered colonists, who saw the writs as "unreasonable searches and seizures" that deprived persons of "life, liberty, or property, without due process". The early Congress wrote forfeiture laws based on British maritime law to help federal tax collectors collect customs duties, which financed most of the expenses of the federal government in the early days of the republic. Seizures allowed government to confiscate property from citizens who failed to pay taxes or customs duties. The Supreme Court upheld these forfeiture statutes in situations where it was virtually impossible to get hold of guilty persons on the high seas while possible to get hold of their property. During much of the 19th century there was not much attention paid to forfeiture laws. 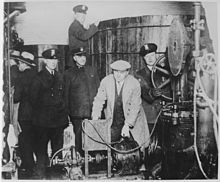 During Prohibition, Detroit police inspect equipment suspected of being used to make alcohol; under civil forfeiture laws, police could seize the equipment without having to charge any owners with a crime. Government used forfeiture during the Prohibition years 1920–1933. Police seized vehicles and equipment and cash and other property from bootleggers. When Prohibition ended in 1933, much of the forfeiture activity ended as well, and modern forfeiture was an "infrequent resort" until the last few decades. Civil forfeiture activity increased substantially in the past thirty years. It stepped up forfeiture during the War on Drugs during the early 1980s and onwards. It became harder for criminal organizations to launder dirty money by means of the financial system, so drug cartels preferred bulk payments of cash. Illegal drugs are a big business; one estimate was that the annual profit from selling illegal drugs was $12 billion, according to the United States Drug Enforcement Administration. The initial intent, similar to methods used to try to fight alcohol trafficking and use during the Prohibition era, was to use civil forfeitures as a weapon against drug kingpins. According to journalist Sarah Stillman, a major turning point in forfeiture activity was the passage of the Comprehensive Crime Control Act of 1984. This law permitted local and federal law enforcement agencies to divvy up the seized assets and cash. Civil forfeiture allowed federal and local governments to "extract swift penalties from white-collar criminals and offer restitution to victims of fraud", according to Stillman. From 1985 to 1993, authorities confiscated $3 billion of cash and other property based on the federal Asset Forfeiture Program, which included both civil and criminal forfeitures. The methods were supported by the Reagan administration as a crime fighting strategy. It's now possible for a drug dealer to serve time in a forfeiture-financed prison after being arrested by agents driving a forfeiture-provided automobile while working in a forfeiture-funded sting operation. —  Reagan attorney general Richard Thornburgh in 1989. The politics of civil forfeiture were somewhat unusual. The federal forfeiture laws were introduced and pushed through by Republicans in the 1980s, with support from some Democrats; but efforts to reform forfeiture laws have also come from the right, as libertarians in Congress have focused on the basic idea as offensive to property rights. In many areas civil forfeiture adversely affects persons from minorities and low-income communities, in which the typical seizure is less than $500, and Democrats have also been critical of civil forfeiture programs. The ACLU has also been a long time opponent. Forfeiture was used for purposes other than trying to discourage illegal drug activity, such as attempts in New York City to discourage drunk driving. Forfeiture rules were used to confiscate cars of intoxicated motorists. In such instances, there are two types of cases: a criminal case against the drunk driver as a person, and a civil case against the property used to facilitate the drunk driving, specifically their car. Critics contend that the punishment can be "deemed out of proportion with the offense"; for example, after a drunk driver is arrested and convicted and possibly imprisoned, is it proper to punish him or her additionally by civil forfeiture means by confiscating a $50,000 car? Civil forfeiture has been used to discourage illegal activities such as cockfighting, drag racing, gambling in basements, poaching of endangered fish, securities fraud, and other illegal activity. 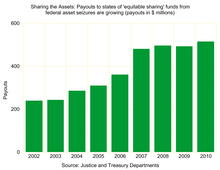 A chart showing that payouts are growing, according to the equitable sharing arrangement. Source: United States Justice and Treasury Departments. Courts helped set up the legal framework to help law enforcement stem the drug tide while sometimes trying to rein in abuses. A 1984 law set up the equitable sharing arrangement in which state and local police can share the seizures with federal agents. 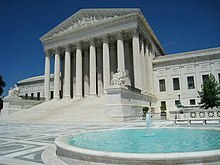 While the 1993 Supreme Court case Austin v. United States ruled that a forfeiture could be considered as an excessive fine, the court upheld the principle of civil forfeiture generally. A 1996 Supreme Court decision ruled that prosecuting a person for a crime and seizing his or her property via civil forfeiture did not constitute double jeopardy, and therefore did not violate the Constitution. However, in 1999, the Supreme Court ruled that civil forfeiture was not permitted if the amount seized was "grossly disproportional" to the gravity of the offense. Legislatures played a role as well. Since the 1990s, the number of federal statutes permitting government forfeiture doubled from 200 to 400. In 2000, lawmakers passed the Civil Asset Forfeiture Reform Act, or CAFRA, which stipulated protections for individuals and increased the level of proof required. Critics said that the new guidelines did not require poor persons to have free access to legal services. CAFRA guidelines suggest that if a claimant wins a civil-forfeiture case, that some of the legal fees paid to recover the property are partially payable by the government. CAFRA was supposed to raise government's burden of proof before seizing property. CAFRA meant if government loses a forfeiture challenge, government must pay the victim's attorney costs, but often victims are unaware of this fact, so they fail to hire lawyers thinking the cost will be prohibitive. Police forces heeded instruction from a law enforcement consultant named Joe David who had an "uncanny talent for finding cocaine and cash in cars and trucks", according to one report. Officers trained in David's so-called Desert Snow stop-and-seizure techniques raked in $427 million from highway encounters during a five-year period. A contract allowed David's consulting firm to keep 25% of the seized cash. But when innocent owners were sometimes ensnarled in seizure proceedings, it spurred criticism. In the early 1990s, San Francisco-based defense attorney Brenda Grantland organized a group called Forfeiture Endangers American Rights (which spells the letters FEAR), with branches in New Jersey, Virginia, California, and Massachusetts. Debate about reforming civil forfeiture procedures happened in the late 1990s but after public scrutiny died down, lawmakers quietly relaxed the reforms at the behest of police groups and prosecutors without much public debate. Civil forfeiture was used successfully on many occasions. For example, it was used to seize assets by corrupt foreigners, such as against Teodoro Nguema Obiang Mangue, who stole money from the African nation of Equatorial Guinea and was convicted. Overall, the pattern in recent decades has been a substantial increase in forfeiture activity. According to government records, Justice department seizures went from $27 million in 1985 to $556 million in 1993 and $4.2 billion in 2012. In 2015, Eric Holder ended the policy of "adoptive forfeiture", which occurred "when a state or local law enforcement agency seizes property pursuant to state law and requests that a federal agency take the seized asset and forfeit it under federal law" due to abuse. Although states proceeded to curtail the powers of police to seize assets, actions by the Justice Department in July 2017 have sought to reinstate police seizure powers that simultaneously raise funding for federal agencies and local law enforcement. Civil procedure cases generally involve disputes between two private citizens, often about money or property, while criminal procedure involves a dispute between a private citizen and the state, usually because a law has been broken. In legal systems based on British law such as that of the United States, civil and criminal law cases are handled differently, with different tests and standards and procedures, and this is true of forfeiture proceedings as well. Both civil and criminal forfeiture involve the taking of assets by police. In civil forfeiture, assets are seized by police based on a suspicion of wrongdoing, and without having to charge a person with specific wrongdoing, with the case being between police and the thing itself, sometimes referred to by the Latin term in rem, meaning "against the property"; the property itself is the defendant and no criminal charge against the owner is needed. In contrast, criminal forfeiture is a legal action brought as "part of the criminal prosecution of a defendant", described by the Latin term in personam, meaning "against the person", and happens when government indicts or charges the property that is either used in connection with a crime, or derived from a crime, that is suspected of being committed by the defendant; the seized assets are temporarily held and become government property officially after an accused person has been convicted by a court of law; if the person is found to be not guilty, the seized property must be returned. The tests to establish the burden of proof are different; in civil forfeiture, the test in most cases is whether police feel there is a preponderance of the evidence suggesting wrongdoing; in criminal forfeiture, the test is whether police feel the evidence is beyond a reasonable doubt, which is a tougher test to meet. If property is seized in a civil forfeiture, it is "up to the owner to prove that his cash is clean". Normally both civil and criminal forfeiture require involvement by the judiciary; however, there is a variant of civil forfeiture called administrative forfeiture, which is essentially a civil forfeiture that does not require involvement by the judiciary, which derives its powers from the Tariff Act of 1930, and empowers police to seize banned imported merchandise, as well as things used to import or transport or store a controlled substance, money, or other property that is less than $500,000 value. The Supreme Court has generally upheld the principle of civil forfeiture. Punishment and deterrence. To punish and deter criminal activity by depriving criminals of property used or acquired through illegal activities. Enhance police cooperation. To enhance cooperation among foreign, federal, state, and local law enforcement agencies, through the equitable sharing of assets recovered through this program. Revenue for law enforcement. As a byproduct, to produce revenues to enhance forfeitures and strengthen law enforcement. Since police can charge a person with a crime in a criminal case and charge his or her things in a civil case, issues such as double jeopardy have been raised. Further, there has been debate about whether seizures of property are considered as a fine or as a punishment in a legal sense. The distinction was clarified by the Supreme Court in United States v. Bajakajian, which decreed that a criminal forfeiture could be considered as both a type of fine and a punishment, while a civil forfeiture was not intended as a punishment of a person but rather a "legal fiction of punishing the property". As a result, the court decreed that civil forfeitures that served as remedial were not considered as a type of fine. The United States Supreme Court has upheld the principle of civil asset forfeiture at the federal level. The Court ruled in Austin v. United States (1993) that such civil forfeiture, treated as punitive actions, are subject to the Excessive Fines clause of the Eighth Amendment. The Supreme Court ruled in Timbs v. Indiana (2019) that protection against excessive fees in civil forfeiture is also incorporated against state and local government. In addition, there are more than 400 federal statutes that empower police to take assets from convicted criminals, as well as from persons not charged with criminality. Sometimes the seizures happen as a result of different government agencies working together, such as the Internal Revenue Service and the Department of Justice. Police at national and state levels cooperate in many instances according to procedural laws known as equitable sharing. In addition, there are laws that make it difficult for criminals to get dirty money clean by methods of money laundering; for example, law requires that cash deposits greater than $10,000 to a bank account be reported by the bank to the federal government, and there have been instances in which repeated cash deposits under this amount have looked suspicious to authorities even though they were done legitimately, leading to civil forfeiture seizures directly from a bank account. What has caused controversy is when the property of innocent persons is seized by police who believe that the seized items were involved in criminal activity. Although there are accessible statistics of seizures at the federal level, it often happens that the totals of forfeitures from both criminals and innocent owners are combined; for example, one report was that in 2010, government seized $2.5 billion in assets from criminals and innocent owners by forfeiture methods, and the totals of assets seized incorrectly from innocent owners was not separated statistically. Further, since the United States is a federal republic with governments at both the national and state level, there are civil forfeiture seizures at the state level, which are not tracked and recorded in any central database, which make it difficult to make assessments, since state laws and procedures vary widely. According to The Washington Post, federal asset forfeiture in 2014 accounted for over $5 billion going into Justice and Treasury Department coffers, while in comparison, official statistics show that the amount stolen from citizens by burglars during that same year was a mere $3.5 billion. 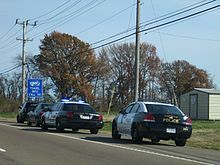 A motorist stopped by police in Tennessee. In a civil forfeiture case in the United States, the state is the plaintiff and a thing is the defendant—in this case, the thing is $25,180 cash that was seized by police under suspicion of being involved in illegal activity. In legal terms, it is an in rem case (against a thing) as opposed to an in personam case (against a person). Here is the docket for a real case that happened after police seized money. One method of intercepting funds is by highway interdictions, typically along highway routes suspected to be used regularly by drug smugglers, often between Mexico and the United States. Mandrel Stuart and his girlfriend were on a date driving on Interstate 66 ... The traffic stop on that balmy afternoon in August 2012 was the beginning of a dizzying encounter that would leave Stuart shaken and wondering whether he had been singled out because he was black and had a police record. Over the next two hours, he would be detained without charges, handcuffed and taken to a nearby police station ... stripped of $17,550 in cash ... earned through ... a small barbecue restaurant ... he was going to use the money that night for supplies and equipment. Javier Gonzalez was carrying $10,000 cash in a briefcase and got pulled over in Texas; deputies handed Gonzalez a waiver, that if he signed over the money and did not claim it later, he would not be arrested, but if he refused to sign the waiver, Gonzalez would be arrested for money-laundering. Gonzalez signed the waiver wondering if the officers were real "officers of law" and wondering if he got robbed, but later sued the county, which lost, and returned his cash plus paid him $110,000 in damages plus attorney's fees. Matt Lee of Clare, Michigan, was driving to California with $2,500 cash when pulled over by police in Nevada, who seized almost all of the cash under suspicion that it was a "drug run"; Lee hired an attorney who took half as his fee, leaving Lee with only $1130 remaining. I just couldn't believe that police could do that to anyone ... It's like they are at war with innocent people. Tan Nguyen. In 2008, a federal judge ordered $50,000 returned to a man after police seized the money during a traffic stop in Nebraska, after reviewing a recording of the seizure in which a sheriff's deputy suggested that we "take his money and, um, count it as a drug seizure". Tan Nguyen's $50,000 was confiscated by police during a traffic stop, and the county agreed to return the funds after a legal challenge. In May 2010 a couple was driving from New York to Florida and they were stopped by police because of a cracked windshield. During questioning, the officer decided that $32,000 cash in the van was "probably involved in criminal or drug-related activity", seized it, shared it with federal authorities under equitable sharing. The victim hired a lawyer to get back the seized money who urged settling for half of the seized amount, and after the lawyer's fees, the victim got back only $7,000. A 2013 The New Yorker piece detailed abuses in Tenaha, Texas, where police would target out-of-state drivers using rental cars, often not issuing traffic tickets, and disproportionately pulling over African Americans and Latino-Americans. Police sometimes ask stopped motorists to sign "roadside property waivers", which, unless signed, threaten criminal charges unless valuables are handed over; the waivers say, in effect, that victims will not contest the seizure in exchange for not being arrested. If a passing motorist does not sign a waiver and it becomes recorded as a legal case, the case names are often unusual. In a civil forfeiture case, the asset itself is listed as the "defendant". For example, one case was titled State of Texas v. One Gold Crucifix, based on a traffic stop in which a woman was pulled over, no charges were filed, but this item of jewelry was seized. Another case name was United States v. $35,651.11 in U.S. Currency. The Washington Post analyzed 400 seizures in 17 states that were examples of equitable sharing arrangements. Police stop motorists under the pretext of a minor traffic infraction, and "analyze" the intentions of motorists by assessing nervousness, and request permission to search the vehicle without a warrant; however, of the 400 seizures studied by The Washington Post, police did not make any arrests. Cash has been seized in peculiar circumstances. For example, New York businessman James Lieto's $392,000 in cash was seized by federal authorities, since his legitimate funds mixed up with illegal funds in an armored car that was seized by an FBI probe. Lieto had to wait until the government's criminal case was finished before he could get his money back, which took considerable time, and caused considerable financial hardship and stress. Police have broken into homes. In March 2012, in the middle of the night, without a warrant, New York City police burst into the home of Gerald Bryan, ransacked his belongings, ripped out light fixtures, arrested him, and seized $4,800 of his cash, but after a year, the case against him was dropped. When Bryan tried to get back his money, he was told it was "too late" since the money had already been put into the police pension fund. Victims of forfeiture often find themselves faced with fighting in a "labyrinthine" procedure to get their money back. In May, 2013, IRS agents seized $32,821 from the account of a restaurant owner in Arnolds Park, Iowa, on suspicion of tax evasion, but the seizure was contested by lawyers from the Institute for Justice. Prosecutors threatened to seize a motel, similar to this one owned by the Caswell family, when there was illegal drug use on the premises in Chelmsford, Massachusetts. Police can seize not only cash from cars but real estate such as a person's home. For example, homes have been seized even if someone other than the homeowner on the premises committed drug crimes without the owner's awareness. If the IRS suspects that property is involved with crime, or has been produced as a result of crime, then it has a pretext with which to seize it. From 2010 to 2013, two motel owners were under constant threat of their property being seized after there were incidents of drug selling on the motel premises. A judge ruled in 2013 that the owners could keep their motel since the owners did not know about the illegal activity and took all reasonable steps to prevent it. I'd like to see this law done away with, or heavily modified ... This law, where you are presumed guilty and have to prove yourself innocent, is completely backward from any other law I've ever heard of. It's hard to believe the government has that kind of power. It's ridiculous. Prosecutors abuse it, and the average person can't afford to fight it. Police seized a house on the pretext that it was being used for selling drugs, after a couple's son was arrested for selling $40 worth of illegal drugs. In another case, homeowners Carl and Mary Shelden sold their house to a man who was later convicted of fraud, but because of the real estate transaction, the Sheldens got caught up in a 10-year legal battle that left them "virtually bankrupt"; after years, they finally got back their house but it was in badly damaged condition; the Sheldens had done nothing wrong. In Detroit, men suspected of hiring prostitutes had their automobiles seized. An owner's sailboat was taken after he was caught with a negligible amount of marijuana. Members of the Bergen County Prosecutor's Office were charged with fraud after knowingly selling counterfeit goods at an asset forfeiture auction. Five states (California, Connecticut, Indiana, New York, and Oregon) have statutes that allow law enforcement officials to seize a person's firearms without a warrant or court order if there is probable cause the individual is mentally unstable or may use the weapons to commit a crime. The weapons are to be held in the custody of the law enforcement agency until the case against the individual is dispositioned in a court of law; or the weapons must be returned to the owner if no criminal charges are filed within the timeframe specified by law. In practice, some law enforcement agencies in these states have been known to either sell or destroy seized firearms without compensating the owner after the legal matter that led to the initial seizure has been settled. The government can seize money directly from a bank account. One way this happens is when there are large numbers of cash deposits that government investigators suspect are structured as a way to avoid deposits exceeding $10,000, since deposits greater than that amount must be reported to the federal government. But it can happen that legitimate businesses have regular large deposits of cash. In one instance, the Internal Revenue Service waited for large deposits to be placed into an owner's bank account, and then forced the bank by legal means to surrender it to the agency by means of a secret warrant; authorities took $135,000 from Michigan restaurant owners, named the Cheung family, who made cash deposits from their Chinese restaurant. In another instance, a businessman in New Jersey made repeated cash deposits to save for purchasing a house; each payment was below the $10,000 threshold for reporting to the government, but there were 21 deposits over a period of four months, which caused government to suspect that criminal activity was involved; as a result, the IRS seized $157,000 and the businessman was forced to hire an attorney to get his funds returned. Officials seized $35,000 from the bank account of a grocery store "without any warning or explanation" in 2013. After police and authorities have possession of cash or other seized property, there are two ways in which the seized assets become permanently theirs: first, if a prosecutor can prove that seized assets were connected to criminal activity in a courtroom, or second, if nobody tries to claim the seized assets. What happens in many instances is that the assets revert to police ownership by default. If a victim challenges the seizure, prosecutors sometimes offer to return half of the seized funds as part of a deal in exchange for not suing. Sometimes police, challenged by lawyers or by victims, volunteer to return all of the money provided that the victim promises not to sue police or prosecutors; according to The Washington Post, many victims sign simply to get some or all of their money back. Victims often have "long legal struggles to get their money back". One estimate was that only one percent of federally taken property is ever returned to their former owners. Statistical evidence suggests a strong upward trend in recent years towards greater seizure activity. 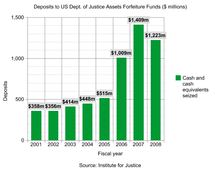 In 1986, the Department of Justice's Asset Forfeiture Fund took in $93.7 million; in 2008, it took in $1 billion. Much of this growth happened in the past decade; one analysis suggested that seizures had grown 600 percent from 2002 to 2012. From 2005 to 2010, government seizures of assets from both criminals as well as innocent citizens went from $1.25 billion to $2.50 billion. Federal authorities seized over $4 billion in 2013 through forfeiture, with some of the money being taken from innocent victims. In 2010, there were 15,000 cases of forfeitures. Over 12 years, agencies have taken $20 billion in cash, securities, other property from drug bosses and Wall Street tycoons as well as "ordinary Americans who have not committed crimes". One estimate was that in 85% of civil forfeiture instances, the property owner was never charged with a crime. In 2010, there were 11,000 noncriminal forfeiture cases. In 2010, claimants challenged 1,800 civil forfeiture seizures in federal court. Wisconsin Preponderance of the Evidence (greater weight of the credible evidence). Civil forfeiture varies greatly state by state. An analysis by Sarah Stillman in The New Yorker suggested that states that place seized funds in neutral accounts, such as Maine, Missouri (which puts seized funds in accounts for public education), North Dakota, and Vermont, have been much less likely to have major scandals involving forfeiture abuse. States like Texas and Virginia and Georgia, which have few restrictions on how police use the seized funds have had more scandals, as have states that allow the Equitable sharing program. With Equitable Sharing, state police can "skirt state restrictions on the use of funds", according to Stillman. In Florida, using Equitable Sharing, the small village of Bal Harbour raked in at least $71.5 million in three years by its vice squad by carrying out an undercover money laundering sting operation, but in the end, made no arrests. In 2019, Arkansas enacted a new law that requires felony conviction before forfeiture of related assets with few exceptions. Allows Equitable sharing between state and federal agencies. There are few restrictions on how police use seized assets. Georgia investigators found more than $700,000 in "questionable expenses" by Camden County's sheriff between 2004 and 2008, including a $90,000 Dodge Viper and a $79,000 boat. Seized funds go into neutral accounts. In Maryland, police forfeitures were $6 million in 2012 and $2.8 million in 2013. Minnesota passed a law in 2014 forbidding authorities from confiscating a suspect's property unless they have been convicted of a crime or plead guilty to committing it. Seized funds go into accounts earmarked for public education. In June 2015, governor Steve Bullock signed a law requiring authorities to first get a criminal conviction before seizing property through civil forfeiture. State civil forfeiture standard was beyond a reasonable doubt but in 2016 it was changed to require a criminal conviction first before any assets could be seized. There were allegations that Nevada police unlawfully took tens of thousands of dollars from motorists. New York City ransacked a home, seized cash, but it was later returned. Seized funds or property are forfeited if any connection to any drug crime is proved by a preponderance of the evidence. Once forfeited, the seizing agency can keep and use the funds largely at its discretion. Due to the lack of any state reporting or centralized accounting, no accurate total of seizures is available, but estimates tend to run in the tens of millions each year, much from known drug trafficking corridors such as Interstate 40. Notable abuses of forfeiture funds include prosecutors paying off student loans and living in seized houses rent free. In Philadelphia, it is often the homes of African-Americans and Hispanics who are targeted by civil forfeiture abuses; what happens in many instances is that a child or grandchild who doesn't own the home is nabbed on a drug-related offense, and police use this as a pretext to seize the entire home. In Philadelphia, authorities made thousands of "small-dollar seizures"; in 2010, the city filed 8,000 forfeiture cases, which amounted to $550 for the average take. From 2002 to 2012, Philadelphia seized $64 million by means of its forfeiture program, a total that was more than that seized by Brooklyn and Los Angeles combined. In Texas, in Jim Wells County, authorities seized more than $1.5 million during a four-year period mostly off of U.S. Route 281, described as a "prime smuggling route for drugs going north and money coming south". Seized cash is a third of the budget of the sheriff's department, allowing it to buy more equipment, high-powered rifles, and police vehicles. There are few restrictions on how police use seized funds. In some counties in Texas, 40% of police revenue comes from forfeitures. Texas, with many smuggling corridors to Mexico, and police seized $125 million in 2007. Few restrictions on how police use seized assets. Victims seeking to get their seized property back in Washington, D.C., may be charged up to $2500 for the right to challenge a police seizure in court, and it can take months or years for a decision to finally happen. State civil forfeiture standard is preponderance of the evidence (Wis Stat sec. 961.555(3). Civil forfeiture has generated substantial controversy. FBI special agent Douglas Leff argues that civil forfeiture is a necessary tool for law enforcement to combat money laundering by criminal operatives. Proponents argue that civil forfeiture tactics are necessary to help police fight serious crime. It is seen as a vital and powerful weapon in the continuing battle against illegal drugs, and effective at discouraging criminal activity. It makes it easier for law enforcement to fight organized crime when they had trouble imprisoning offenders, since they could deprive them of their property and income when it is much harder to prove their guilt in a court of law. Prosecutors choose civil forfeiture not because of the standard of proof, but because it is often the only way to confiscate the instrumentalities of crime. The alternative, criminal forfeiture, requires a criminal trial and a conviction. Without civil forfeiture, we could not confiscate the assets of drug cartels whose leaders remain beyond the reach of United States extradition laws and who cannot be brought to trial. Moreover, criminal forfeiture reaches only a defendant's own property. Without civil forfeiture, an airplane used to smuggle drugs could not be seized, even if the pilot was arrested, because the pilot invariably is not the owner of the plane. Nor could law enforcement agencies confiscate cash carried by a drug courier who doesn't own it, or a building turned into a "crack house" by tenants with the knowing approval of the landlord. The head of the asset forfeiture section of the Department of Justice said that civil forfeiture of cash from innocents was insignificant compared to the "thousands of traffic stops" that bust major drug money couriers. What's troubling to you? That a drug trafficker who's bringing money from the U.S. to Mexico, who's carrying hundreds of thousands of millions of dollars in cash in their pickup truck, who just sold dope and crack and cocaine to children in your playgrounds, and his money is being taken away? That troubles you? Police used civil forfeiture laws to help return swindled funds to their owners. Photo: Convicted swindler Bernard Madoff. Civil forfeiture has been used to restore money stolen by fraud and other schemes by corrupt politicians. Civil forfeiture targets cybercrime, fraud, and scams in high finance at Wall Street, and money-laundering on a global scale. It enables police to have sufficient power to "return money to crime victims" in instances of swindling or fraud. 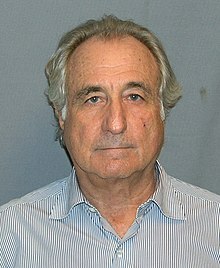 Civil forfeiture laws were helpful in enabling authorities to seize and return swindled funds by the Bernard Madoff fraud. Proponents argue that government has sufficient safeguards in place so that individuals can challenge seizures if the need arises. Justice William H. Rehnquist said in a Supreme Court decision that federal forfeiture in drug-related cases was not a punishment but served nonpunitive purposes such as encouraging people to be careful that their property was not used illegally. A lobbyist for the Maryland State Police named Thomas Williams argued that bills to require police to keep better records of seized property would cost law enforcement more time and money, and that trying to track seizures by multi-agency task forces would not be easy. Proponents say that when claimants contest the seizures, they rarely win back their money, suggesting that the "system is working properly". Proponents say the system is monitored to make sure seizures are properly done. In addition, the funds enable police forces to equip themselves further for more effective crime prevention; for example, a $3.8 million drug bust let officers equip their cars with $1,700 video cameras and heat-sensing equipment for a seven-member force. Flawed judicial process. Critics suggest that civil forfeitures are mostly "devoid of due process". Arguments have been made that the seizures violate the Due Process Clause of the Constitution since owners have few means to challenge the seizures. They see some seizures as assaults against individual rights. Critics argue that criminals are treated better in the courts than innocent owners who have property seized, since criminals are often told they have a right to an attorney, and that the beyond a reasonable doubt standard of proof is much higher in criminal trials than in civil trials. Burden of proof is shifted to victims to prove innocence. Victims of civil forfeiture are considered guilty until proven innocent, thereby turning the principle of innocent until proven guilty on its head. Because it is part of the civil justice system, there are no attorneys provided for defendants as can happen in some criminal trials; people who can not afford an attorney have slim chances of recovering their property. Most cases are never heard by a jury or judge since victims are unable to fight the seizures by hiring a lawyer. In contrast to principles of open justice, seizures are often done through sealed documents with a lack of transparency. Clinical law professor Louis Rulli of the University of Pennsylvania said that a piece of property does not have the same rights as a human: no right to an attorney, no presumption of innocence. Excessive punishment. Justice John Paul Stevens said in a single dissenting vote in 1996 that civil forfeiture of a house, in which marijuana had been illegally processed, was an example of an excessive fine, and a violation of the Eighth Amendment, although the majority of the court disagreed. Critics contend that the lure of cash tempts police towards subverting the rules for personal gain. If a cop stops a car going north with a trunk full of cocaine, that makes great press coverage, makes a great photo. Then they destroy the cocaine ... If they catch 'em going south with a suitcase full of cash, the police department just paid for its budget for the year. Innocent owners ensnared. Critics argue that innocent owners suffer emotionally and financially. Difficult to challenge seizures. The process forces property owners with limited financial abilities to have to hire attorneys and take time and money simply to "prove their innocence". Victims must actively fight to recover their seized property; if they do nothing, or wait, then they will lose everything. If victims do not seek help from sympathetic lawyers such as those of the Institute for Justice, they can sometimes be offered to have a fraction of their property returned as part of a deal; critics have described the IRS as "bullies" practicing "extortion" against innocent citizens. Procedures to get money back are often fraught with difficulty. Retrieving seized property can be a "bureaucratic nightmare" where victims meet not with a judge or jury but with a prosecutor. Arbitrary punishments. Critics suggest that civil forfeitures can be arbitrary, varying significantly from one case to another; for example, Alan Finder in The New York Times wondered whether it was "fair that one driver loses a car worth $45,000 and another loses one worth $700? ", if each situation resulted from drunk driving arrests. Unfairly targets poor and politically weak persons. Many victims of civil forfeiture are "poor and politically weak" and unable to mount a sustained battle in the courts to get their property returned. Subverts state law. Local and state police often cooperate with federal authorities in what has been called equitable sharing agreements. Since many states have laws restricting or limiting civil forfeitures, as well as requiring higher standards of proof before property can be taken, local police can sidestep these rules by treating the suspected criminal activity as a federal crime, and bringing in federal authorities. As a result, after the seizure, local and federal agencies divvy up the "loot" with 10% to 20% of it going to the federal agency and the remainder to the local police force. Accordingly, equitable sharing "effectively subverts the will and intent of the state legislatures" and has been criticized by prominent civil rights attorney and property rights advocate Scott Bullock as being a "complete violation" of the principle of federalism. Extent of abuse. Proponents and critics differ about the extent of cases in which innocent persons had their property seized. Proponents argue that the cases are few in number, while critics contend that many instances of abuse happen without awareness by the public as a result of the signing of waivers, victims not challenging seizures for lack of knowledge, and other reasons related to a general lack of judicial transparency. The Baltimore Sun made reports that in 2012, half of victims with seized assets were not convicted of a crime. Comedian and political commentator John Oliver did a sixteen-minute segment on his show Last Week Tonight in 2014 discussing civil forfeiture. There have been numerous reports in the media about systemic abuse of civil forfeiture. USA Today described it as "an increasingly common—and utterly outrageous—practice that can amount to legalized theft by police". Reporter Sarah Stillman writing in The New Yorker interviewed numerous police officers, lawyers, prosecutors, justices and plaintiffs around the United States and found that many had reservations that innocent Americans were being abused. The New Yorker published a "sprawling investigation" about how cities abuse civil forfeiture to "bolster their cash-strapped coffers by seizing the assets of the poor, often on trumped up charges". Comedian John Oliver devoted a presentation to a satirical exposure of civil forfeiture in 2014. Organizations working for reform, as well as helping individual victims, include the Institute for Justice, a libertarian nonprofit law firm in Washington, D.C., which works to end civil forfeiture abuse. It has helped numerous clients recover property seized by the government. The Institute of Justice is helping one forfeiture victim sue the federal district court as well as the mayor, district attorney, and police commissioner in Philadelphia. Scott Bullock, senior attorney at the Institute for Justice, advocates that civil forfeiture should be abolished except for use in enforcing maritime and customs laws, and require that any seizures be linked to criminal convictions of specific people. If that is not possible, Bullock recommends that seized revenues be placed in neutral funds such as drug treatment efforts, that standards of proof for law enforcement be raised to ensure that police provide "clear and convincing evidence" of wrongdoing, that the burden of proof should be moved to government to prove wrongdoing, that seized assets should be tracked such that information is easily accessible by the public, and that the equitable sharing arrangement be abolished. Sometimes victims turn to the American Civil Liberties Union (ACLU) for legal assistance in winning back their seized property. There has been opposition to civil forfeiture in some lower courts. There have been attempts by lawmakers to introduce legislation to prevent abuses based on civil forfeiture procedures; one proposal was to raise the standard of proof necessary before property could be seized, and require government to prove that an owner of property was involved in an illegal criminal activity before such seizures could happen. There have been class action lawsuits against authorities, such as one in East Texas by black and Latino drivers; the suit alleges that police took $3 million from 2006 to 2008 in 140 separate incidents. One reform effort is to require authorities to keep better records about seized assets. In 2015, the New Mexico legislature outlawed civil forfeiture. Also in 2015 a number of criminal justice reformers, including the Koch family foundations and the ACLU, announced plans to advocate the reduction of asset forfeitures due to the disproportionate penalty it places on low-income wrongdoers; the forfeiture of private property in such cases often results in the deprivation of the majority of an individual's wealth. As civil forfeiture may not be allowed a new practice has emerged. By classifying valuables such as cars, cellphones, and wallets with cash as evidence the police can keep them and by making it very difficult and time consuming to get them back. After 120 days the police can sell the items. The Drug Enforcement Administration (DEA) has been using civil forfeiture as one way of funding their efforts to combat the use of illegal drugs, including marijuana, which continues to be illegal to possess under Federal law as of 2019. According to government figures, the DEA collected $18 million in 2013 as part of its Cannabis Eradication Program. Proponents in favor of legalizing marijuana have objected to this practice, which includes DEA seizures of properties in which marijuana is used and sold. A bill has been proposed in the United States Congress to eliminate this source of funding. As more states progress towards legalizing marijuana for medical use and for recreational use, there are more businesses to sell marijuana, sometimes called dispensaries or "weed shops". A report in The Guardian in 2015 suggested that such shops operated in a "tricky gray zone", so that even in the 23 states where medicinal cannabis is legal, such dispensaries can be "wiped out by a single visit from law enforcement". While state law may recognize such establishments as having a legal purpose, federal law does not recognize this, and conflicting interpretations can emerge, which can result in properties being confiscated. It has sparked controversy and, in some instances, public outrage. ^ Adam Liptak and Shaila Dewan, February 20, 2018, The New York Times, Supreme Court Limits Police Powers to Seize Private Property, Retrieved February 21, 2019, "...WASHINGTON — The Supreme Court ruled ... the Constitution places limits on the ability of states and localities to take and keep cash, cars, houses and other private property used to commit crimes...."
^ a b c d e f g h i j k l m n o p q r s t u v w x y z aa ab Sarah Stillman (August 12, 2013). "Taken: Under civil forfeiture, Americans who haven't been charged with wrongdoing can be stripped of their cash, cars, and even homes. Is that all we're losing?". The New Yorker. Retrieved October 11, 2014. ^ Office of Public Affairs, January 15, 2017, The Justice Department, Attorney General Prohibits Federal Agency Adoptions of Assets Seized by State and Local Law Enforcement Agencies, Retrieved July 22, 2017, "Attorney General Prohibits Federal Agency Adoptions of Assets Seized by State and Local Law Enforcement Agencies"
^ Christopher Ingraham, July 19, 2017, The Washington Post, "Jeff Sessions's Justice Department turns a $65 million asset forfeiture spigot back on", Retrieved July 19, 2017, "... But the changes announced today turn that cash spigot back on ... more law enforcement agencies now have the incentive to sidestep those reforms via the reinstated adoptive forfeiture process...."
^ Greenhouse, Linda (June 23, 1998). "Supreme Court Roundup; Justices Narrow the Uses of Forfeiture". The New York Times. Retrieved November 23, 2018. ^ Liptak, Adam (June 25, 2018). "He Sold Drugs for $225. Indiana Took His $42,000 Land Rover". The New York Times. Retrieved November 21, 2018. ^ "U.S. high court buttresses constitutional ban on 'excessive fines'". Reuters. 2019-02-20. Retrieved 2019-02-20. ^ Christopher Ingraham November 23, 2015, The Washington Post, Law enforcement took more stuff from people than burglars did last year, Retrieved November 24, 2015, "... In 2014, for the first time ever, law enforcement officers took more property from American citizens than burglars did. ..."
^ Note: when there are numerous cash deposits, each below the $10,000 threshold for reporting requirements, it is sometimes called structuring and is a federal crime, as well as being a method often used to conceal illegal activity. ^ a b November 4, 2014, Russ Mitchell, Dickinson County News, May 2015 date likely to settle Mrs. Lady's case, Retrieved April 3, 2015, "... accounts are often seized without any real investigation. Agents simply looked at her bank deposits and saw frequent bank deposits of less than $10,000. ..."
^ Daniel Finney, The Des Moines Register, November 2, 2014, Forfeiture target calls it 'a violation of civil rights', Retrieved April 3, 2015, "... May 2013 when two Internal Revenue Service agents knocked on the door of her Spirit Lake home ..."
^ Ron Silver (June 14, 2017). "After Fraud Charges, Bergen Prosecutors Attempt Another Suspicious Auction". New Jersey Corruption. Archived from the original on September 4, 2017. ^ Bakala, Brendan. "Rauner signs civil asset forfeiture reform into law". Illinois Policy. Illinois Policy. Retrieved 18 December 2018. ^ "Senate Bill 1044 (2016) - The Florida Senate". www.flsenate.gov. Retrieved 2017-06-26. ^ "Connecticut Just Banned Civil Forfeiture Without A Criminal Conviction". Forbes. Retrieved 2018-03-06. ^ a b "§ 90-112". www.ncga.state.nc.us. Retrieved 2017-06-26. ^ a b LTC. "Nebraska Legislature - Legislative Document". nebraskalegislature.gov. Retrieved 2017-06-26. ^ Ciaramella|Mar. 14, C. J.; Pm, 2019 4:14 (2019-03-14). "Arkansas Legislature Effectively Votes To Abolish Civil Asset Forfeiture - Hit & Run". Reason.com. Retrieved 2019-03-20. ^ a b Dan Boyd, Capitol Bureau Chief (April 2015). "Civil asset forfeiture bill signed into law by Gov. Susana Martinez". Albuquerque Journal. Retrieved May 12, 2015. Gov. Susana Martinez does not like the term "policing for profit", but she still signed into law today a measure aimed at barring law enforcement from seizing money, cars or other types of property from people on civil grounds during an arrest or traffic stop on suspicion the property was connected to a crime. ^ "Forfeiture foes debate from opposite ends of the turnpike". Retrieved 2015-10-03. ^ Adcock, Clifton. "Law Enforcement Seizures Misspent, Missing". Oklahoma Watch. Retrieved 2015-10-03. ^ Editorial Board (20 November 2014). "When police play bounty hunter: Our view: Civil asset forfeiture is government at its absolute worst". USA Today. Retrieved 7 December 2014. ^ "DEA Announces Actions Related to Marijuana and Industrial Hemp". United States Drug Enforcement Administration. August 11, 2016. Retrieved August 18, 2016. ^ "DEA declines to loosen restrictions on medical marijuana". CNN. August 12, 2016. Retrieved August 18, 2016. ^ U.S. Department of Justice (16 May 2014). "Drug Enforcement Administration FY 2014 Performance Budget Congressional Submission". Drug Enforcement Administration. Retrieved 10 February 2016. ^ Nick Sibilla (21 September 2015). "New Bill Would Cut Off Federal Forfeiture Funds For DEA Marijuana Seizures". Nick Sibilla. Retrieved 10 February 2016. ^ Ted W. Lieu (16 September 2015). "Introduction of the Bill" (PDF). Retrieved 10 February 2016. Civil forfeiture, from HBO's political comedy program Last Week Tonight with John Oliver.